Amsterdam, 11 November 1999 — In the week leading up to the start of World Trade Organisation negotiations in Seattle, the Dutch Minister for Development, Minister Herfkens, gave her full support for trade rules that allow developing countries to produce medicines at affordable prices. Seventeen million people die every year from infectious diseases world-wide. 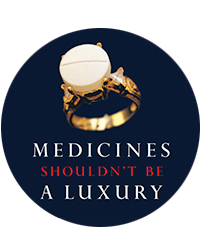 Most of these deaths occur in poor countries where people cannot afford the medicines. International rules that govern the trade and patenting of medicines allow restrictions to patent holder rights in order to meet public health needs. The Minister called for allowing poor countries to exercise their rights without interference from the US or other developed countries. ‘We should come out firmly in favour of compulsory licences, enabling governments to issue licenses to national producers... such a measure could lead to a seventy-five percent drop in prices,’’ stated Minister Herfkens, addressing the conference ‘Increasing access to essential drugs in a globalised economy’ organised by Health Action International, Médecins Sans Frontières and the Consumer Project on Technology. Over 350 participants from 50 different countries attended the conference, which included representatives from government, NGOs, academics and industry from around the world. Minister Herfkens went on to explain that when South Africa recently adopted a law that allows compulsory licensing it found itself under attack from a number of wealthy countries. “We cannot accept the kind of bilateral dealings in which one country puts pressure on another to enforce certain laws, or refrains from enforcing them. What the Netherlands wants is an open, transparent, multilateral system. And that applies to TRIPS [the trade agreements that cover patents] too.” Recent US bilateral agreements with developing countries has curtailed the right to introduce compulsory licensing. The Minister insisted that in order to be allowed to produce life-saving medicines at an affordable price, countries need the full support of the US and EU. The World Health Organisation also voiced support for compulsory licenses. ‘Where there is an abuse of patent rights, where patented essential drugs are not on the market, or where a national emergency exists, recourse to compulsory licensing is a legitimate measure consistent with the TRIPS agreement.’ Said Dr Gro Harlem Brundtland, Director-General of WHO, in a televised address to conference participants. Representatives of HAI, MSF and CPTech will attend the WTO meeting in Seattle to support increased access to medicines. Specifically they will be calling for the initiation of a WTO working group on Access to Medicines.